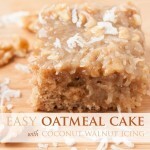 Easy Coffee Cake Recipe - Easy, Tasty, and Freezable! It’s the dream, right? Eating cake first thing in the morning as you sip your coffee. Well today we’re making dreams come true with this easy coffee cake recipe. Coffee by its very nature is meant to be enjoyed slowly. Morning coffee time is one of our favorite times of day. Huddled on the couch with our 3 kids. Careful not to sit on the dog, Turbo (he’s an itty-bitty little guy), who is undoubtedly snuggled under the shared blanket for warmth. And then the Pavlovian beep of the coffee maker draws us to the kitchen for our morning cup (or two). It’s a welcome time of day when things move a little slower. Before the hustle and bustle of the day spins up. The only thing that could make this fleeting time of the day better? Well…cake, of course. It only seems natural that the coffee drinkers of the world would eventually say, “Hey, what can I have to go with this?”. Enter coffee cake. The only cake that’s socially acceptable to have for breakfast. Which isn’t to say I haven’t occasionally indulged in a slice of leftover heath bar cake or oatmeal cake with my coffee (shhh!). 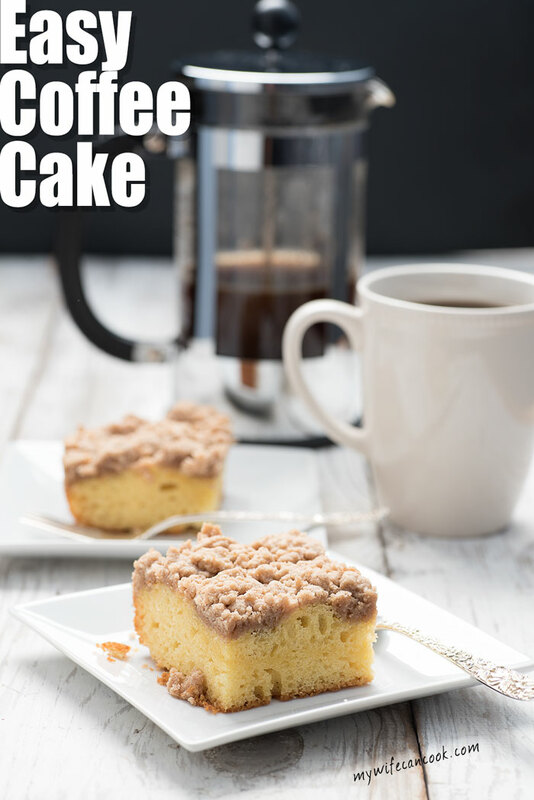 Coffee cake comes in various forms but they all arise from one simple idea…the desire for some sort of delicious pastry or cake-like item to enjoy with your morning coffee. An idea we can all get behind! Just be sure to get your behind in motion later in the day to work off some calories. In a 3 kid house, coffee cake is dangerous. Our kids already think that Mommy and Daddy stay up and eat candy every night after they go to bed. And on those nights when they do wander down after their bedtimes and find us eating dessert there’s always a look of betrayal in their eyes. Now, they’re going to come down in the morning and find us eating coffee cake? Ah well, their feelings of betrayal will quickly give way to elation when we tell them they can have a slice. 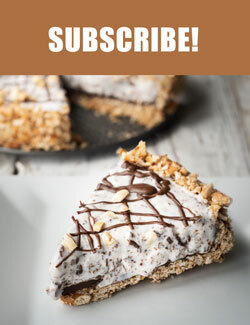 This coffee cake isn’t an every day treat, but it is a really perfect comfort food for holidays and special occasions. 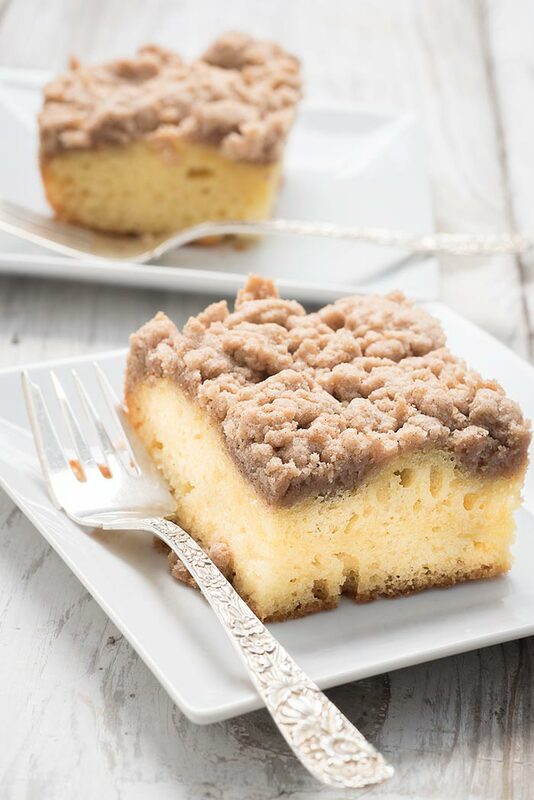 It’s very popular at coffee hours at work (how to make one of those long work meetings go better–coffee cake) or after church get-togethers. 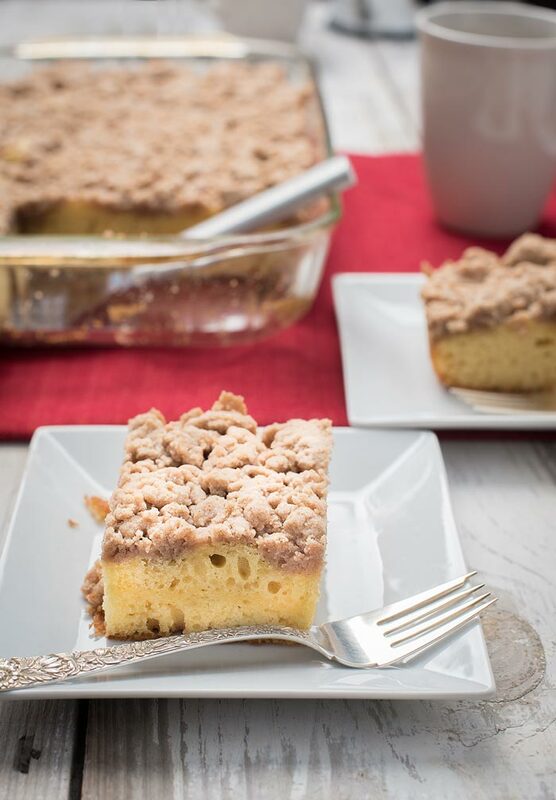 The only thing is…if I’m hosting a big meal later in the day I don’t always have extra energy for a complicated recipe which is why I LOVE this easy coffee cake recipe. 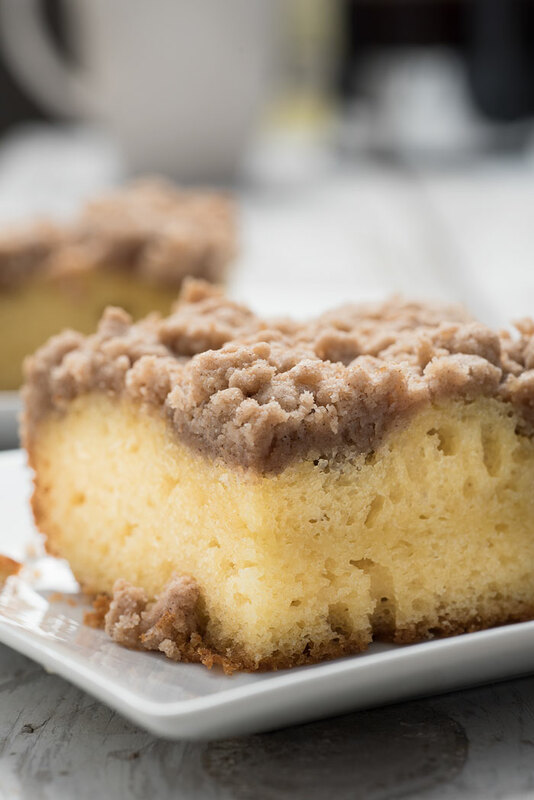 I’m sure you can find at least a few complicated recipes in this list of next level coffee cakes, but the goal with this coffee cake is making things easy. Mix up the cake mix, mix up the topping while the cake starts baking, then top with crumb topping, and bake for a little longer. Then it’s, ready to go! It even tastes delicious when you freeze it and save for another time. Just slice it up and store tightly wrapped in the freezer and pull out a day before (or night before) you are going to serve it and it’s ready to go. So go ahead and give this easy coffee cake recipe a try. I’m thinking of making it again (why not?!) 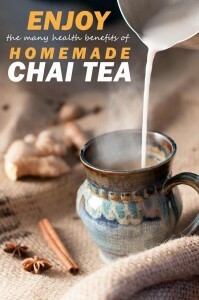 and pairing it with this delicious looking slow-cooker pumpkin spice latte I found over on the Kitchn. Make cake mix according to directions on the box and stir in 1 tsp. vanilla. Pour cake batter in greased 13x9 inch pan. While cake is baking, mix together remaining ingredients until clumping together (I used food processor)--similar to a crisp or crumb cake texture. Remove cake from oven and sprinkle crumb topping all over top of cake. Sprinkle with white powdered sugar and serve. 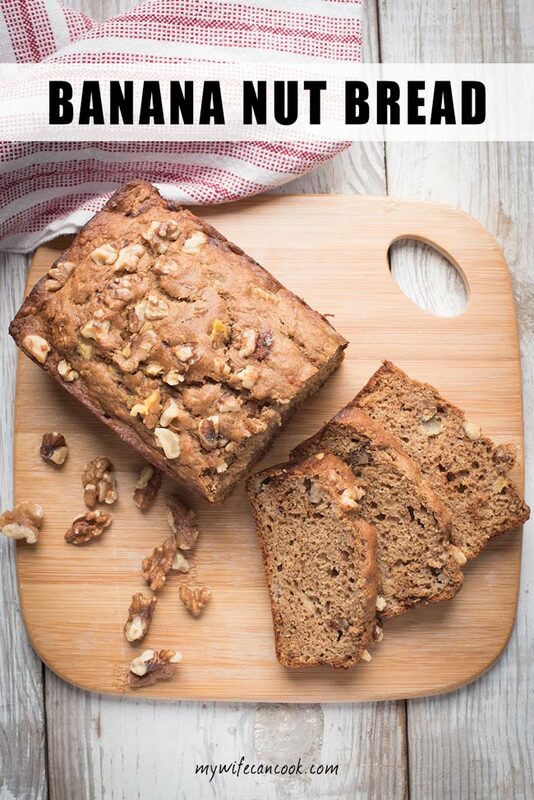 Your Coffee Cake looks very beautiful and delicious. I will try to bake it and hope I can serve the cake that would make my family happy. 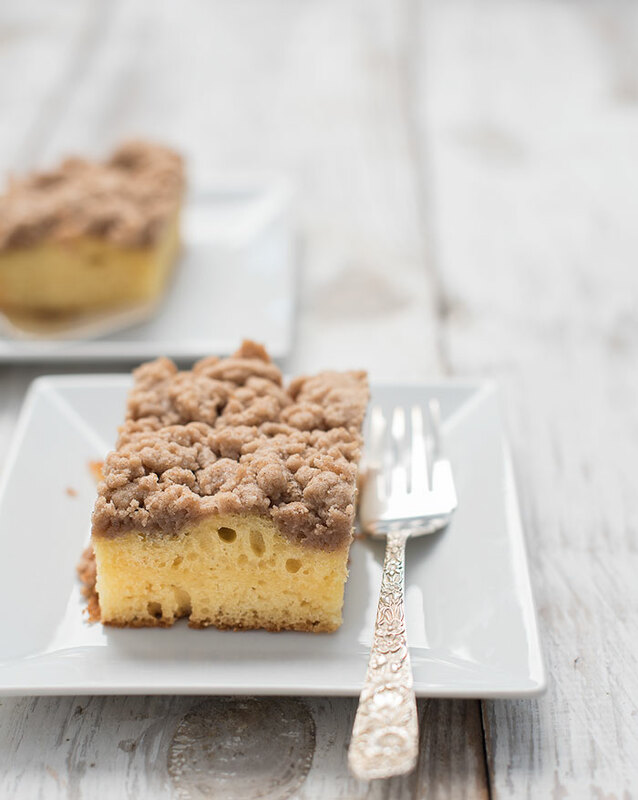 Coffee cake is such a simple and delicious treat. Everyone has a great recipe or two up their sleeve. 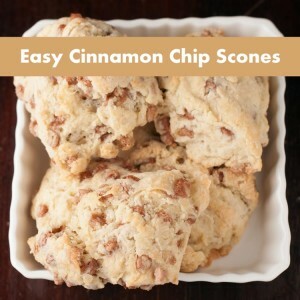 Perfect for making in a hurry…and always delicious. I love eating it for breakfast!! Thanks, Gloria! Yes, coffee cake is a wonderful treat! 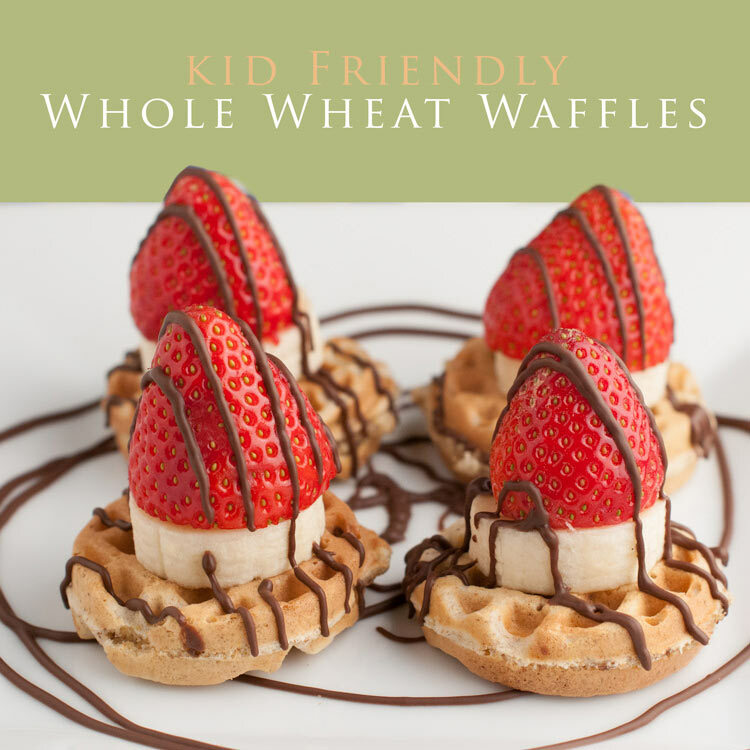 Such a cool idea elevating a pre-boxed mix – definitely makes this treat easy and accessible! And I personally find that cake for breakfast makes any day so much better! Thanks, Julia! Definitely easier! Cake for breakfast definitely makes the day better! 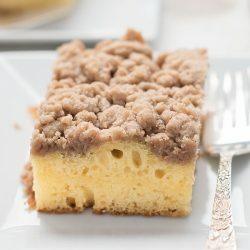 I love homemade coffee cake and it has to have an awesome crumb on top. Can’t wait to try this recipe! This looks so delicious! Love coffee cakes, perfect anytime. 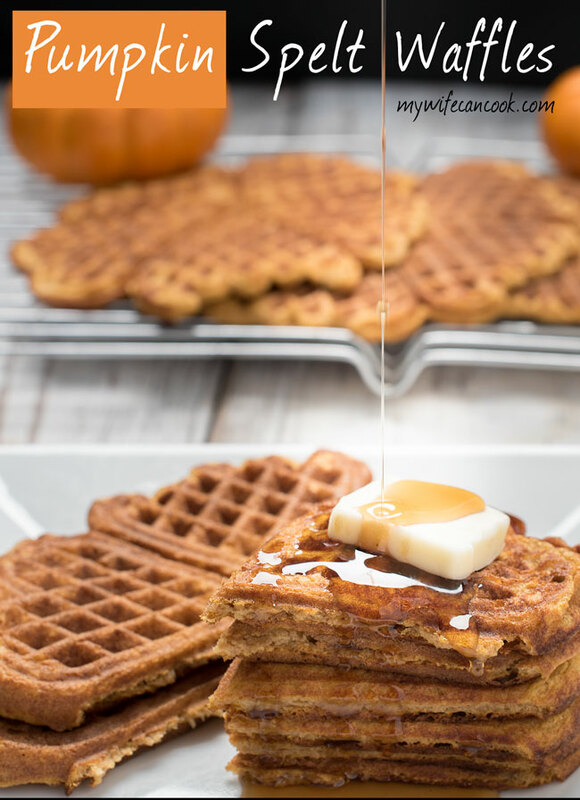 Do you think this could be baked in a small muffin pan and if so do you think the cook time would be different? Just thought it might be easier to bring to a ladies meeting as muffins and might go farther as small muffins. I have never tried it as muffins, but I am guessing it would work. Maybe check the time on the box for cupcakes and add a couple extra minutes? Bake and put the crumb topping on at the half way point? Could I use margarine sticks instead of butter? Sorry to hear it didn’t work out. Let us know if you try with less flour and have better luck, it’s always worked for us. The topping definitely needs to be well mixed or will be too crumbly.